How to get a Pakistan visa in Kuala Lumpur? Even if we managed to hitchhike all over Iran and touring with folding bikes in Indonesia, we have tried, without success, to go to Pakistan for years. I still remember that morning in Kathmandu, in 2012, when someone from the buzzer at the Pakistan Embassy told me with a metallic distortion in the voice that “if you are not a resident of Nepal, I am sorry, we cannot issue you any visas”. The rules have changed in March 2019, with Pakistan opening an online e-visa portal that allows citizens of more than 50 countries (and more coming up) to lodge their tourist visas applications online. Malaysian citizen are among few nationalities that can get a visa on arrival with multiple entries for up to 30 days — still, going through the evisa portal is necessary. We haven’t tried ourselves as of yet, but what is certain is that, for the moment, the Pakistan eVisa cannot be used at land borders, but only if flying direct into the country. This means that, even if there is an eVisa system in place, travelers who are on the road still can’t get and use their visas for overland entry. So, for example, if you thought of taking the cheap Scoot or AirAsia flights from Kuala Lumpur to Amritsar (check our review of the Lucknow to Singapore Scoot flight ) and cross the Wagah border to Lahore, well, you can’t. So, for all those who are not flying direct into Pakistan, the situation remains the same it has been throughout the years: your country of origin or residency are the only places you can refer to for a Pakistan visa. I come from Italy where, for a long time, the High Commission of Pakistan even refused to give tourist visas because of the potential threat of terrorism. And when I had a Malaysian Student visa in the past, the timing was just not right to apply and travel to South Asia. We managed to go to Pakistan in May 2018, resolute to visit the country whose mountains have been on the top of our travel bucket list for years. Kit had no problem in applying in her own country, and I had just received my Malaysian Long Term Social Pass last March. The case now was knowing if we needed a Letter of Invitation, but my calls to the High Commission of Pakistan in Kuala Lumpur, 400km to the south from Penang where we live, never received an answer. An LOI was indeed needed, together with a scan of the National Identity card of the Pakistani national who invited us. The embassy website also reported that, if not having an LOI, the applicant should submit a detailed itinerary, with some hotel bookings to support their stay. We cannot advise on the second option, as it was not our case, but we have read a report of a Malaysian woman on the Backpacking Pakistan Facebook Group who claimed she got her visa just submitting an 18 days itinerary. We suppose that the issue of a visa without an LOI is really subjected to a case by case basis, so, Malaysian citizens, hold your horses, pay a visit to the embassy if you can, and make sure there will be no misunderstanding regarding your application. We had a great experience with Karakoram Bikers, a Pakistani-Australian adventure tour company who supported us in getting our LOI. Liz Norman, with whom I have directed all my queries directly, helped us get a set of fantastic documents which, when presented to the embassy staff, were accepted immediately without the batter of an eyelid. In our case, the High Commission of Pakistan in Kuala Lumpur required an itinerary and evidence of support of a tour operator. I printed all these in colour, put one set in each of our applications (a bunch of passport copies, my proof of marriage and residence in Malaysia, and two letters clarifying my and Kit’s employment situation, plus a bank statement), and submitted. 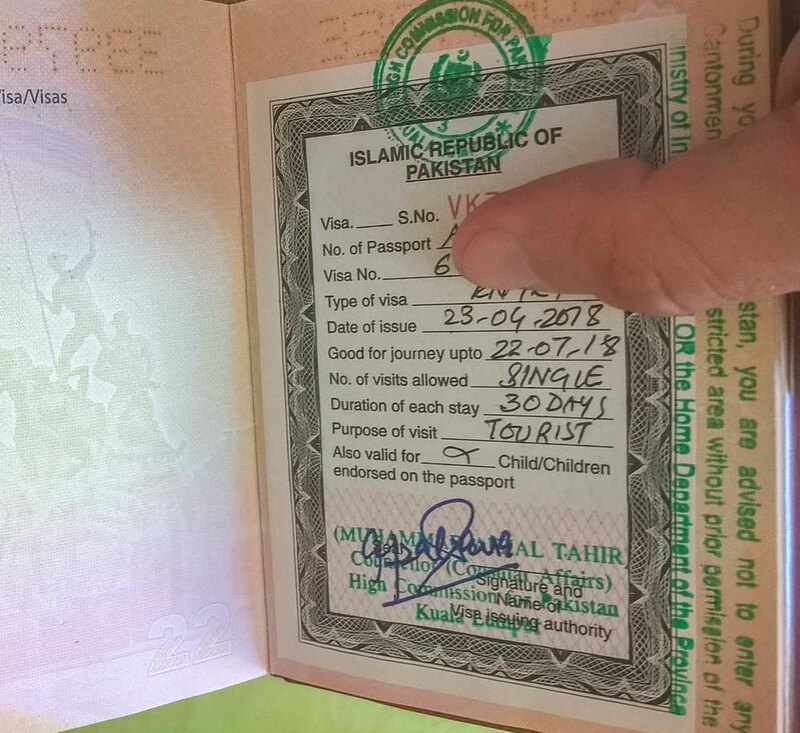 Indeed, it seems like it’s getting harder to travel to Pakistan as an independent traveler: because of the actions of a few gullible members of the backpacking race, apparently the Pakistan Intelligence is now checking tourist visa application much more strictly than before. And until this situation relaxes, you just have to be prepared to go with the flow, or don’t visit Pakistan. OK, keep in mind that your time window for application is limited from 8.30 am to 11.30am (don’t read what the High Commission of Pakistan in Kuala Lumpur’s websites notes, as times are skewed by half hour), and they are closed on Wednesdays. You can go on Monday, Tuesday, Thursday, and Friday only, and beware of holidays — Malaysia has loads. You will queue up, show your documentation to the official, and if everything is fine, you will be asked to pay your visa fee at a nearby AFFIN bank. The bank is thankfully within walking distance: go out of the embassy on Jalan Ampang, and turn to the left (embassy at your back). Keep walking along the block until you reach a traffic light and you see the Petronas Twin Towers soaring on your right. Cross the road, and you should see the AFFIN bank to your left. The staff here knows you have come from the High Commission of Pakistan, and will give you the right pre-compiled slip you must present to the cashier upon paying. The visa fees, to my surprise, are very affordable: RM30 for Malaysians, and RM75 for me, an Italian passport holder. In US$, that’s a ridiculous $6 and $15 respectively. Still need to print or photocopy stuff?? No problem: just go out of AFFIN Bank and keep walking on the left. You will soon see a flyover, and just below it, the Wisma Sentral shopping mall. Enter on the ground floor and there’s immediately a copy shop to your right. Colour prints are RM1 each. Bring a thumb-drive, or you will pay Internet usage for printing documents at RM2 per 15 minutes – not worth. Return with payment slip and documents, and the guard will direct you to another small building where you will sit… and wait. Because you will need to have a short interview with the Consular Officer. The conversation itself was quick: just about 10 minutes, when the Officer asked me some basic questions about our reason to visit Pakistan, and how we got to know our sponsor, Karakoram Bikers. He also asked where we would have stayed while in Pakistan, as we did not submit any reservations. I simply said “Karakoram Bikers will help us find safe hotels and guesthouses,” and that was it. But it was a long wait: all in all, we entered the office at 10 am and went out with receipts at about 12 pm. Malaysians are so lucky they will hand in their documents in the morning, and get their passports back the next day. To third-country nationals like me, it took exactly a week (five working days) from date of submission. Quite a chore if you live far from Kuala Lumpur like us, but it’s possible to delegate someone else to pick up your passport, provided the person comes armed with a letter. Remember: Collection times is only from 4 to 4.30 pm. Be punctual or be sorry. Very very easy. The old colonial building the embassy is located in sits just off Jalan Ampang, in walking distance from either the Dang Wangi or KLCC LRT stops on the Kelana Jaya Line. You can easily board this train from many places in KL, most conveniently from the hubs of Pasar Seni/Chinatown and KL Sentral. Good luck getting your Pakistan visas, Malaysian citizens or residents! It really is a breeze, provided you have the right documents required at the time of application. Every case is different so it pays to check, but again, we really recommend going through Karakoram Bikers. They’re fast, efficient, and very kind in answering all your queries. And most importantly, they CAN speak to the High Commission of Pakistan in Kuala Lumpur’s staff, while you won’t. Trying a hundred calls in vain showed me it’s best to trust Liz and Shah’s business, rather than wasting your own time.